The "very ingenious mechanist" William Brunton (senior) had a wide-ranging civil engineering career in the early years of steam technology. He invented and patented a locomotive propelled by steam-driven mechanical legs, and his ingenuity in heavy industry resulted in eight patents for machinery and processes, including for fire-grates, calcining (thermal treatment of ores) and ore processing. He also worked on railways, marine steam engines and ironworks installations. Born and raised in Scotland, Brunton's early career began in Birmingham before he moved to London and later to south Wales. Brunton was the eldest son of a watch and clock maker from whom he learned mechanics. His grandfather worked in a colliery and taught him engineering. At the age of 13, he started work as a fitter at New Lanark Cotton Mills (founded 1786) on the River Clyde, but more significantly, by 1796 he was working for steam pioneer James Watt (1736-1819) at the Boulton & Watt Soho Foundry in Birmingham. By 1802 he had risen to superintendent of the engine department. 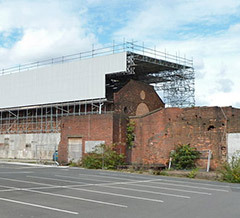 In 1808, Brunton joined William Jessop (1745-1814) and Benjamin Outram's (1764-1805) Butterley Ironworks in Derbyshire to manage its expanding engine factory, making early marine steam engines. Here he is said to have met the distinguished engineers John Rennie (1761-1821) and Thomas Telford (1757-1834). 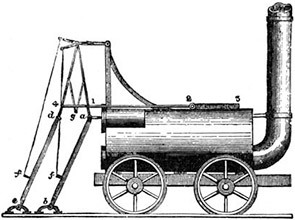 In 1813, Brunton designed and constructed the steam-driven locomotive known as his mechanical traveller or 'steam horse'. It was a four-wheeled locomotive that ran on rails, driven from the rear by a pair of mechanical legs. It was thought that iron wheels running on iron rails wouldn't generate enough traction for motion — the legs were a way to overcome this. The prototype worked for two years on Butterley Gang Road. He was soon working on a larger model, started in 1814 and costing £540. It was used at Newbottle Colliery, County Durham, pulling coal wagons along a 1 in 36 gradient at 4kph. The boiler was replaced in July 1815, and while being tested this boiler exploded, causing around a dozen fatalities and many serious injuries — the first recorded railway disaster. The driver had tampered with the safety valve to make the machine run faster. Although not at fault, Brunton abandoned the project and moved to Birminingham to become a partner in Francis, Smith, Dearman & Brunton at Eagle Foundry, where he worked as mechanical engineer on marine engines for river steamers. After 1825, he moved to London and worked as a consulting civil engineer. Among his projects were the Redruth & Chacewater Railway in Cornwall, and improvements to the Ynysgedwyn Ironworks in Powys, Wales. By 1832 he was working in south Wales, supervising the construction of Claypon's Tramroad, which served Ynysgedwyn Ironworks and other installations. He later became a partner in the Cwmafan tin and copper works north east of Port Talbot, designing copper smelting furnaces and rolling mills, and had a financial interest in Maesteg Iron Works. One of his last inventions was a huge steam-driven colliery fan that improved ventilation at Gelligaer Colliery in Caerphilly. It was Jessop who described Brunton as an ingenious mechanist. He was certainly multi-talented, dedicated and well-known in his time. Though receiving small recompense for his inventions, many were influential. His patented calciner technology was in widespread use in the Cornish tin mining industry, and reportedly in the silver mines of Mexico. 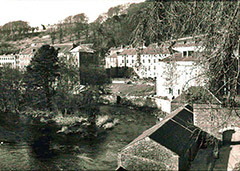 New Lanark Cotton Mills, South Lanarkshire, where Brunton went to work in the fittings shop at the age of 13. The mill settlement had been founded in 1784 by David Dale (1739-1806) with cotton-spinning pioneer Richard Arkwright (1732-92), and used water-driven machinery. The complex included worker's dwellings and a school. Some of what remains of the Boulton & Watt Soho Foundry in Birmingham. Brunton started there as a workman soon after the foundry building was constructed (1796). This was the world's first factory dedicated to steam engine manufacture that produced complete engines. The foundry closed in 1895 and its later owner rebuilt the structure, but some original fabric remains. By 1808, Brunton is managing the newly-enlarged engine manufactory at Butterley Ironworks in Derbyshire, shown above c.1817 (digital recreation). Brunton was working on early marine steam engines. In 1810, he installed one in a dredger for Bristol Dock Company. William Brunton's gravestone. 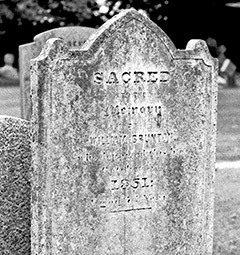 He died of an unidentified illness on 5th October 1851 in Camborne, Cornwall, where he was living with his son William. Brunton was of nonconformist faith. 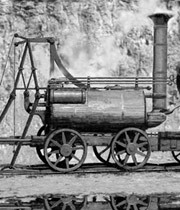 William Brunton's mechanical traveller, or 'steam horse', was a travelling locomotive that gripped the rails with its steam-driven rear legs, preventing the engine from losing traction. 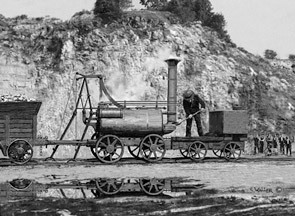 The prototype was in use between 1813-15 on Butterley Gang Road, a steep wagonway that ran from Crich Quarry to the Cromford Canal. Brunton's mechanical traveller cleverly re-imagined in its working context by Simon Waller. 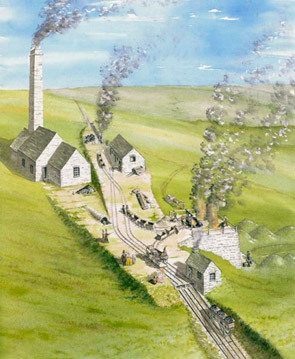 A reconstruction of the Ynysgedwyn Incline engine house complex, Powys, Wales. Brunton worked on the design of the incline between 1832-35 while he was a consulting engineer in London. 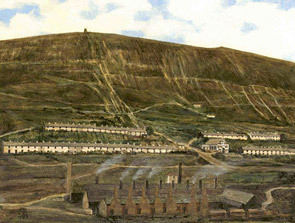 A view of Cwmafan looking north-west, painted in 1983 after an earlier version. The artist is R.W. Harrison. In the foreground is the Cwmafan Copperworks, where Brunton was a director (1935-38). He designed and constructed its smelting furnaces and rolling mills. He was also likely responsible for its ventilation system, best known for Stac-y-Foel (dem. 1940), the brick chimney visible on the mountain (see below). A flue system ran up the slope to the stack, keeping corrosive fumes away from the town but badly affecting local vegetation. 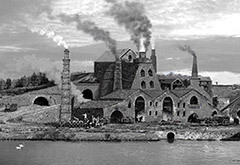 The Cwmafan works by 1910. Stac-y-Foel (dem. 1940) as depicted on an old postcard. 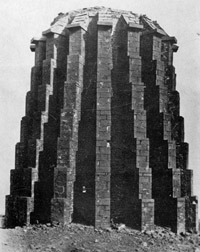 The chimney was removed early in World War II as it was thought it would aid German aircraft navigators.